Wireless Bluetooth speakers are a dime a dozen, so manufacturers resort to gimmicks like unique colors and different form factors to keep customers coming back for more. One of the more creative brands is Logitech’s Ultimate Ears, who has found a way to keep their product line fresh this year with a great upgrade to a popular favorite. Available in six different colors including GreenMachine (blue-green with yellow), Yeti (white with black), and the BrainFreeze (blue with red) model I tested, the new UE Boom 2 is a cylindrical, portable speaker no larger than a water bottle, with power and Bluetooth buttons on top and large, thumb-friendly volume controls on the side. Speaking of agua, Boom 2 is now waterproof: The speaker can be fully immersed in more than three feet of liquid for as long as 30 minutes. Since the earlier model was only IPX4 rated for water resistance, I tested the sequel’s higher IPX7 rating with a dunk in the bathtub, where it not only survived, but kept pumping out the same rich, 360-degree sound and solid bass (it also sounded really cool while submerged). Boom 2 provides such impressive sound by packing two 45 mm active drivers and two 45 mm by 80 mm passive radiators into its compact frame. It doesn’t feel like sacrificing quality for size, and a free companion app for iPhone or Android offers a handful of EQ settings and the ability to use the speaker as an alarm. 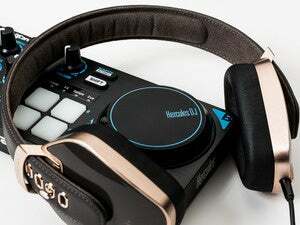 Weighing only 1.2 pounds, Boom 2 keeps the music going for up to 15 hours from a sealed, rechargeable Lithium-Ion battery, charging up from a micro-USB port tucked into the bottom in about two and a half hours; there’s also 3.5 mm audio output and a small hook used for hanging from a strap (not included). Remember that scene in Deliverance where the hillbilly squares off against Ronny Cox’s character to “Dueling Banjos”? Boom 2 owners can participate in the modern equivalent of this back-and-forth music game with two source devices connected at the same time. 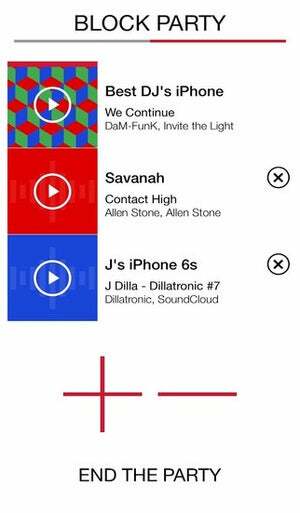 Although up to eight total devices can be paired with Boom 2, Block Party allows two listeners to play DJ, taking turns cutting in on whatever’s currently playing from the other. There’s no overlap in sound—when one device plays, the other pauses automatically; it worked well even with an iPhone 6s Plus and Nexus 7 tablet, and should come in handy for couples co-hosting a party or “Name That Tune” song competitions. You can also control Boom 2 by tapping once on the top to play/pause, or twice to skip to the next song. It’s awesomely convenient, but unfortunately requires the listener to physically pick up the speaker in order for the gesture to be recognized. Personally, I’d get more use out of this feature if it worked while the speaker was sitting upright on a desk or table as well. Like UE Boom, the second-generation speaker can also be configured to wirelessly double up the sound with a second compatible unit from the mobile app. 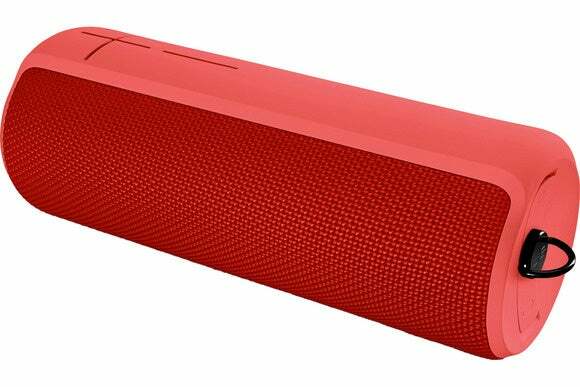 I tested this with a UE Roll and it instantly created an even bigger sound, but the feature also works with UE Megaboom or either UE Boom model. Boom 2 is an excellent follow-up that adds a waterproof housing, gesture control, and playback from two source devices at the same time—not to mention you can pair it with your original model to double up the sound. Boom 2 provides big sound from a stylish, waterproof Bluetooth speaker that can be used with two devices at the same time, and controlled using gestures.